Our portfolio of projects encompasses many different market sectors, click on the images below to see how Kensington can provide for your specialist requirements. We have significant experience in providing canopies, blinds and curtain track solutions to educational buildings in both the private and public sector. Irrespective of the project size or intricacy we approach every education project with a full appreciation for the responsibility and accountability our client has to countless stakeholders. Our teams are experienced in the unique challenges within the education sector and we work to ensure uninterrupted student, staff and visitor safety. Products range from room divider systems, to a specialist range of window blinds designed specifically for educational establishments including total room darkening and audio visual solutions, through to outdoor learning areas. Our experience in supplying and installing blinds and curtain tracks has led to many successfully completed projects in acute, primary and ancillary healthcare facilities for both the private and public sector. We have a full appreciation for the responsibility and accountability our client has to countless stakeholders and we are very capable of meeting the challenges within healthcare work to ensure uninterrupted patient care and patient, staff and visitor safety. Specialist healthcare products range from room divider systems, anti-ligature products through to a specialist range of window shading designed specifically for healthcare establishments. Our commercial portfolio includes projects in many prestigious HQ buildings serving world renown companies. Our specialist range of commercial blind systems have been designed for the demanding environments in to which it is installed, and serve to provide user comfort, building efficiency and a unique corporate image. Achieving the ambience that our clients demand for hospitality and leisure projects is a challenge that Kensington enjoys. Our hospitality portfolio ranges from private boutique establishments through to international chains and encompasses both new and existing premises as well as listed buildings. Kensington products have been used to enhance numerous leisure focused facilities including swimming pools, hotels, gymnasiums, art galleries and rehearsal and recording studios. Our specialist product range has been designed for the demanding environments in to which it is installed, and serve to provide user comfort, building efficiency and a unique aesthetic appearance. Our project portfolio includes local authority offices, courtrooms, libraries, police and fire stations as well as new flagship civic centres across the country. Our carefully selected teams are experienced in the unique challenges within the public sector and work to ensure uninterrupted staff and visitor safety. Products have been designed for the demanding environments in to which it is installed, and serve to provide user comfort, building efficiency and a unique aesthetic appearance. We consistently demonstrate our understanding of the many facets of the retail industry. We have gained demonstrable experience in solving requirements of large scale food outlets and shopping centres through to large banking organisations and branches. Manual and motorised window blind solutions are being used extensively in shop front areas to provide customers and cashiers shading just when it is needed, whilst retaining the aesthetics of the glazed facade. 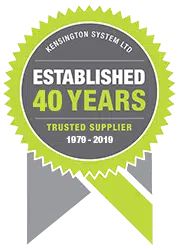 Kensington understands the requirements of working in and around a live store environment, where safety of staff and customers is paramount, as well as the need to maintain opening times.